As a child, I lived in an apartment overlooking K Street, the imperial city centre of pageantry and postcards. When I started piano lessons with Mr Z, our music room contained only a piano and two stools. It was gradually filled up with tapestries, books, chatchkas, and outdoor clothes. Garden tools and furniture were added, then dressers and beds and wardrobes. Finally I saw that our country house now occupied the room. Our servants had vanished, I had noticed. But by that time, kings were being shot in basements, dukes slaved as waiters, princesses took in washing and danced in shows, and prime ministers’ heads were being sent around the country in biscuit tins; people went out for a newspaper, and never came back. Mr Z complained, “This… junk ruins the acoustics.” I was poised over one of my legendary tantrums; that was our country house he was talking about and, I knew, a life we would no longer lead. He gave up on me as a pianist. One day he brought a small guitar, looted, he claimed, when he fought during the Great War, from the apartment of an Irish writer who had lived in Trieste but who had skedaddled at the start of hostilities. After lessons, Mr Z ate supper and gushed about the arts to my parents, who were mystified by it all, despite the music lessons, the paintings on our walls, the books in our library. They only encouraged me to play because my character, defined by petulance and whim, fitted me for no practical subjects. On my eleventh birthday Mr Z barked, “You will never be a musician,” and rapped my knuckles with his conductor’s baton. That night he didn’t stay for supper. He should have, because he blundered into a riot on K Street, by then a focus for demonstrators and wreckers, and was killed with a spade, of all things. But, as if he were still at my side, I sat atop a pile of furniture and boxes in the music room, and practised. At night, with the light off, I was able to play without looking, emulating Mr Z’s blindness, which was the other thing he brought back from the war, a gift from the Italians, wrapped in shrapnel. L’s painting was called “The Father of My Child.” News of her brought up images I rarely recalled. I used to see her gazing out of windows in the block across from mine on K Street, and we exchanged looks as a succession of nannies coincided us in and out. Soon after the disappearance of the nannies, my father had gone out for a newspaper into a place nobody knew, and I had moved away, to relatives in the suburbs. I didn’t see L again till we were in our twenties, loafing in cafés and exchanging looks again, which led us into an affair punctuated by arguments about the theory and practice of art, political compromise, and duty, to the state and to oneself. Over the years since, I had run into her at parties, where we’d bantered merrily, L slipping in barbs to address any of my failings that she hadn’t been able to think of during our liaison. L had only ever had two kinds of opinions on other artists’ work: silence or disdain, the latter often exercised in open letters in the state art magazine under the guise of a thirst for debate. “If you can’t see the superiority of my work,” she had addressed one cabal some years before, “then you are blind blind blind,” and they had gleefully dubbed themselves The Blind School. The glee was diminished, I suppose, when they all vanished, almost overnight, along with any trace of their works. L’s child attended the lower school attached to the Lyceum in which I worked. She was brought and collected each day by a nurse in a chauffeured car. She was dark-eyed and scrawny, with thick black hair, and she brooded; in all those attributes, she was like me. People whispered that our president had a share in the child, and that L was the president’s lover, then had to add hastily that he loved us all. It was L who had painted the portrait of our beloved leader that hung in every workplace. What had appealed to him about it, people guessed, was that the eyes followed yours, and also that it made him look, somehow, both benign and unforgiving. L’s studio was on top of one wing of the presidential palace, surrounded by the rooms she called home. I read the title of her new work again, and had to restrain myself from gazing up at the portrait over my blackboard. The children were clapping in seven-eight time, and I saw that our visitor was unsettled by it. It is cacophonous if there is even one child slightly out. There always is. I signalled for quiet. Hermes looked relieved until I told them to start again. L had always claimed to enjoy music. Whenever it reached the stage of passion, however, a violinist with his eyes shut tight, a pianist whose hair had shaken loose, a singer who reached for a high note and raised her arms, she would sneer, as if the pleasure should be for the listener only. As for the genius of my musicians, my termly concerts were well-attended and well-loathed events, as all parents received summonses much like the one in my hand. I quite understood why an audience could not bear to sit through three hours of children playing music that sounded like works-in-progress. L believed that I had written our song for her. I hadn’t. That was just a lover’s lie. I had chosen a piece from a collection of manuscripts I kept under lock and key at home, and had worked it into a tune I called Quaintrelle’s Chorus. It was in seven-eight, and the children’s clapping prompted my recall of its finer details. I had left it free of hair-loosening crescendos, any drama in it achieved by scatterings of augmented chords, and stategically-placed sevenths. Your answer?” Hermes had really had enough. He expected me to finish the propaganda ministry’s slogan for him, I saw. I just smiled, worldly, urbane. “How can you stand this?” He meant the seven-eight clapping, which was at a beautiful, and transient, point; it would get no better. I refrained from the retort, And how can you stand beating people in cells? The drop in his features told me that he sensed the question. He glanced up at the portrait of his master, and I saw his face compose itself, happy to be that of his official business again. I wanted to impress a girl one afternoon in my early twenties, and a colleague lent me his car. When I got back, he had gone, and his neighbours affected never to have known him, and refused to let me leave the car outside their block. In that car, I travelled the countryside at weekends and during holidays. I was on a deserted road when the engine gave out. With no idea what was wrong, I walked in hope of help towards the next village. I gradually noticed red cloths tied into the hedges, perhaps every half-a-kilometre. At a fork in the road, the cloth pointed away from the village, but I followed it all the same. A Gypsy came to meet me. All his questions pointed to one: was I an official of some kind? When he had made up his mind that I wasn’t, he invited me to his camp which, marked by three red cloths tied into a hedge that had been cut down and put in place again, was up a barely navigable track. He warned me not to mention at the camp that I had spotted the signs. I was depressed by the command; one thing I loved about the countryside was the people’s openness and lack of fear about speaking their minds, unlike in the cities, where we did our jobs, walked the streets, sat in cafés, all without catching the eye of another person in case we somehow made an enemy of them, suspecting ourselves of things we were never sure of. At the camp there were perhaps twenty Gypsies, of all ages from ninety to nine months. My guide deputised a youth to ride a horse up the road and look at my car. The equestrian asked me for the keys, and I saw that I had to agree, or offend him. In the cities we repeated myths about the revenge of slighted Gypsies, and, as I handed the keys over, I realised that I believed them. As I ate with them, they mentioned villages and roads and forests, single tracks and single elms by roadsides, a blind man at a crossroads that they had helped, a canal lock keeper who abused them, a woman weaving at her door who shared her meagre food. They told me about a man who had invited them to draw water from a village well, and another who had set the local boys to throw stones at them to drive them away from the well, in case they cursed it and it dried up. It was such a perfect picture of Gypsy life that I sensed it was all a story, but I appreciated the way they were pitching in to weave it together for me. They had been clearing out a wagon so that they could set up an oven to fashion an order of copper pans for a local landowner. Among the items displaced from the wagon was a wooden box containing, I noticed with astonishment, handwritten music. I asked if I could see it, and they laughed, and said that nobody could see music. All the same, my guide bade me examine it. I picked up the first sheet. The writing was that of one of those composers who visited country people in the previous century, transcribing their music for posterity. I had seen some of it in the ethnographic museum. I was about to exclaim, That’s B’s music, when lack of breath and, I must say, guile, shut me up. “Where did you get this?” I asked, and I sensed another tale about to begin, but before it could get going my guide signalled for silence. “Can any of you play it?” I wondered, and they laughed. “We have no use for it.” The guide indicated the oven, and the tools laid out around it. I said, “Then why don’t you give it to…musical Gypsies?” There were plenty of those; I had witnessed their performances at country weddings, full of unsettling expertise, the way they held the music sweetly on the brink of chaos but never let it go there. “Why?” I asked, but they had told me enough. Some of them moved eyebrows and shoulders in scorn. “Then you don’t value it.” I thought I was being cunning, but really I knew that nobody can out-think a Gypsy; that’s why people have always shunned Gypsies or hated them. I read the opening bars of a piece in eleven-eight. I hummed the tune, and somebody shouted bravo and clapped. Then they all clapped the complicated rhythm like it was in their blood, and they closed in, faces bright with the joy of making noise. “Can I buy it from you?” My question broke the silence; it was the one towards which we had all been heading, I knew. As the others went about their business, my guide sucked in his breath. “It has great sentimental value for us,” he said. In the week before L’s unveiling, I filtered its soundtrack through my insomnia. I stood on my balcony during a storm, heard the birds in the trees on the square chirping diminished chords, imagined them cursed with the faces of the genius children L wanted to play at her concerto de camera. I was privileged to teach some proto-virtuosi; fifteen seemed to be the age at which they attained the confident possession of talent. The looks on the girls’ faces revealed that they had mastered arcana; the boys just looked smug, dizzy with their own cleverness. Quaintrelle’s Chorus had only ever been played by me, usually naked, sitting on L’s bed, using my tiny Triestine guitar. To do it the full gothic justice its composer had meant for it, I began to see, it needed more, some woodwind, some brass, some low strings, perhaps. Over several breakfasts in the Eagle Café, ignoring the myopic factotum Hermes in his corner, I arranged it all over a percussion part using only handclaps. I would counter, “Well, one can easily burn a canvas.” I had already lost the argument, though, because L only painted onto walls; foundries, factories, churches, museums, the lobby of the state opera house, the insides of triumphal arches – all edifices that would outlast the states that had built them. To suggest bombs and bulldozers would have been sheer sedition. My geniuses reduced Quaintrelle’s Chorus to dull perfection. During rehearsals, the silence at the end of the piece revealed some of them looking at me quizzically, as if to say, Is that all it is? “Wonderful,” I yawned, and told them to do it again, but better, and I heard Quaintrelle’s Chorus as the soundtrack of the night L and I broke up. We were walking by the river past the Gypsies’ part of the city. Their firelit eyes fixed on us, and dismissed us, not knowing of our genius with paint and sound. I remembered our song, and the day I exchanged it for the car. “I’m sure they’ll all let you know as soon as that happens.” I laughed. “Yes,” I had to admit. I dismissed the geniuses early. They were talented, but too jaded; they would ruin the song by rendering it too perfectly. I had no further classes that afternoon, so I studied the plan for the next morning’s lesson with my eleven year olds. Eleven was the age to be for that mix of sweetness to the edge of chaos, I had always felt; they would never be brighter, or more charming—after the age of eleven they would be distracted, and ruined, by hormones and ideologies, the intricacies of rifles and childbirth. They were the real genii, and we would work magic. On the night of the unveiling, I led my musicians through the city. When they began clapping in seven-eight, it disconcerted the tram passengers, and the presidential guardian who met us at the palace’s servants’ entrance. “But… what are they doing?” he asked me. I left him staring, dismayed, at my invitation as the orchestra abandoned its clapophony and made its way through in a flurry of arms and instrument cases, herded through corridors by puzzled guards. The tastelessness of the palace’s main hall awed me into silence. The walls were lined in layers of crumbling stone and poorly-pointed brick, and hanging in alcoves like game trophies were icons of dead soldiers and politicians, the president’s onetime friends. The surroundings were meant to inspire silence, but silence cannot be worked onto eleven year-olds. In a raucous confusion, we descended on the stage area, and began the business of unpacking and tuning, the arrangement of seating. “But where is N?” I asked, struck suddenly by the absence of one of the clarinettists; a dumpy kid with honey-coloured hair and freckles, and obsessive green eyes, her clarinet was to have soared, or, in her case, barged, in and out of the second verse to underline the tune. Nobody knew or cared where she was, apart perhaps from the boy flautist I deputised to play her part, who looked at it in panic. “Where is the audience?” a child asked me. It was a better question. “The musicians always arrive early,” I assured her, but I sensed our audience around us, eyes following us from apertures in the walls, like those of the president himself in that wretched portrait with which L had cursed us all. But where was the artist, and who was the father of her child? Her masterpiece lay behind a curtain on one side of the room. I resisted the urge to wander over and take a peek. The audience entered during the second run-through of the song. It was a crowd of functionaries in suits and uniforms, and at the sight of us they stopped, confused. In the midst of them shambled a wild-eyed man, unshaven and unkempt, our president. My musicians abandoned their craft and stood and yelled, “Greetings, our president,” the way the etiquette handbook had instructed. I begrudged it, a little; it was his place, so surely he should have been greeting us? Our glorious leader looked like a barbarian who had just been roused. But above all, he looked anguished, at the sight of us all, at the greeting, at the sound of the music, which groaned into life again as soon as the children sat down. The president beckoned an aide, who beckoned another, and they all had a hurried discussion that ran to a silence culminating in a collective stare across the room to the man I knew as Hermes. And, concentrated, smiling, almost, my genii ignored their conductor and stuttered into musical momentum. I was too busy watching the cabaret out in the audience. The palace factota were puzzled, hesitant. None of them watched L as she stepped quickly to the curtain guarding her picture, and wrapped the cord around her wrist. The president saw her though and, I thought, was begging her not to pull it. Declaiming the title over and over, L pulled. The masterpiece was simply a giant-sized rendition, on the palace wall, of the presidential portrait we saw in every public place. There were some differences: he was wearing a tatty brocaded dressing gown much like the one worn by the living, seething president, and he looked much like the man we saw; wizened, mean, dull-eyed and corrupted by his own invincibility, a man who had no friends because he’d had them all murdered. With no conductor, the music and clapping wavered on the verge of chaos, then managed a fleeting perfection. The functionaries were advancing on us. The last thing I saw was the determined face of Hermes as, my arms gripped from behind by one of his colleagues, he pressed his thumbs into my eyes and expertly turned them in their sockets, a second’s work to put my lights out forever. I can’t remember how many republics Parisians have had, and their short-arsed tyrants, Robespierres and Napoleons; their oppressors have never been able to enforce their stupid laws. Parisians keep their air of liberty, even if equality and fraternity may be sadly lacking. Perhaps it’s all to do with their natural obstinacy. They make it clear that they don’t like me stealing their thunder in concert halls, or teaching their morose children at the Conservatory. But as long as I don’t overdraw at the bank, or slight any of their dignitaries at official receptions, I am now, and forever, one of them. My apartment overlooks the Batignolles Park, said to be beautiful. But, probably, it’s just a park, variegated in spring and autumn, green in summer, white in winter, full of dog-walking dames, starchy nannies, and crow-like concierges. N described it for me all the same. She had been the child who feigned sickness on the evening of L’s unveiling to cover her ineptitude on the clarinet: a genuine stroke of genius, ensuring the survival of her sight. At the age of twenty-five, having gained an expertise enabling her to play anything, in any style, she had wriggled under that Iron Curtain, and made her way to Paris, and to me. She had become my eyes, and the source of all my comforts. One night at a recital I was giving, it was whispered during the interval that a lady from my country was in the audience, a real lady in black lace and pearls. But then any roaming Romanov or hapless Habsburg with dumpling skin and a scratchy voice was said to be from my country. When the musty aristocrat was shown into my dressing room, she was revealed as no lady, but celebrity émigré artist LM. The first time L called on me, N left me to remind L of the evening her crazy lover ordered the blinding of the artist, the conductor, and the orchestra, N’s unfortunate classmates. 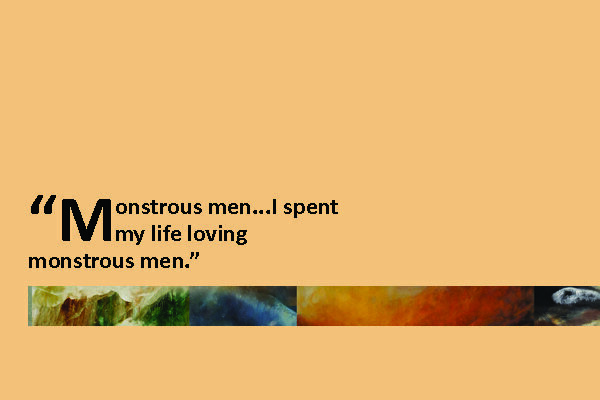 It wasn’t long before L was contrite, wailing, “I spent my life loving monstrous men.” I brought this particular drama to a close by asking about L’s child. What had become of her? “She was dull, and untalented,” L began. “Were you sad?” I wondered. When she moved in, L insisted that N should go. It was the right time. N had met an American impresario who was dying to show her New York, and I had sensed for a while that it was long past time for her to be among her own kind, the sighted, the young; I had been feeling uncomfortably like a jailer. She was replaced by a rotund Romany woman called J. But I liked the straightforwardness and sense that J brought to our lives. One night, when L was sleeping off what she claimed was a particularly Parisian strain of depression—I was sure all the bottles of plonk didn’t help—J told me about the cheerful vagabondage of her people in France, how they made their dark children and their bright pots and cloth flowers and played a gothic kind of jazz on guitars. I told her about the Gypsies I had once met, and their stories and their food and their fire, and about their red threads in the hedges, and she dismissed them thus: “Coppersmiths, they never laugh.” And I couldn’t recall any of them laughing. But who had anything to laugh about in those times, and in that country of mine, except me, clutching my contraband music? One November morning J sat on the balcony smoking with us, and described her people down in the park in the fog, wading into the pond and breaking the swans’ necks and bagging them to take them home to eat. I then recalled how one day soon after N’s arrival we had been in the park, and N had explained the splashing commotion I could hear: two black swans were mating with vigour, which had made me harry N back upstairs so that we too could mate. The memory silenced me. “Swans mate for life.” L was outraged. J laughed, and L dismissed her, bade her go laundering or marketing. “Of course.” I hadn’t thought of the apartment on K Street for a long time. “Oh? Well, I remember you painting.” I thought I did, anyway. “What about it?” I remembered the claustrophobia and the clutter. I recalled a trace of quinine on Mr Z’s breath, rusting buttons on his jacket. L was silent, but I had to assume she was about to ask why. And so he had been, but not by me. I saw his slight, distant figure again, saw his hesitation when he heard the crowd filling the street, the shouting and running, the breaking of glass and the thump of stones, pistols going off. He started, and dropped his cane, and lurched away from the wall to find it, leading him into the path of the spade, which I’d meant only to clatter next to him. I couldn’t argue with her. I pondered the kindnesses I’d tried to do throughout my life; they worked, but were all somehow solipsistic, and whimsical. I had often recalled Hermes in the Eagle Café, sipping carefully at his coffee under L’s portrait of the president. I could never get a picture of his whole face, just his eyes, anxious, exposed, whereas it was my eyes that were exposed, by his fingers, for the last time. L told me he was killed by precipitation from the top of the palace, not for mislaying his glasses, but for forgetting to cancel the musicians on the night of the unveiling, once the president’s agents had discovered L’s ridiculous plan to show the world the father of her child. He could have done with some wings, then. When L told me that, I realised that I had never been able to picture him properly because I had been seeking a picture of another monstrous man, when I should have been searching for the face worn by people who trust and believe in despots and gods, the blinking, genial face of a child. Nick Sweeney’s novel Laikonik Express was published by Unthank Books in 2011. Much of his work shows his fascination with Eastern Europe and its people and history. When he’s not writing, he plays the guitar with Clash covers band Clashback.